I’ve wanted to share this recipe for quite some time now, but whenever I sit down to get writing I’ve been at a loss for words. That is, anything beyond DELICIOUS, MAKE THIS NOW and enthusiastic MMMMMMMMS. Of course, the latter may be attributed to the fact that I’ve had a forkful of this tangy, sweet-savory braised pork and cheesy grits goodness in my mouth at pretty much every opportunity since early fall, therefore rendering me incapable of producing more than sound effects. (Only slightly hyperbolic…) But seriously, I can’t keep this one to myself any longer, so here it goes. We start off with a can of a delightfully balanced, local-to-me hard cider from Cigar City Cider and Mead. If you can’t find it, no worries. Crispin original or your favorite non-spiced variety should do just fine. You can also go completely booze-free with the non-hard stuff or even some unfiltered apple juice (Trader Joe’s in the refrigerated section is my fave, and tastes delicious with a splash of bourbon and a few shakes of bitters). Into a saucepan it goes to simmer away by half, concentrating the flavors. Be prepared: Your home will smell amazing. What I love most about this recipe comes next, because a pretty cheap cut of meat (pork shoulder) is transformed into something so elegant and mouthwatering with practically no effort. Oh yeah, and it’s all done in a basic cast iron skillet that’ll run you 20 bucks tops — no Dutch oven required! 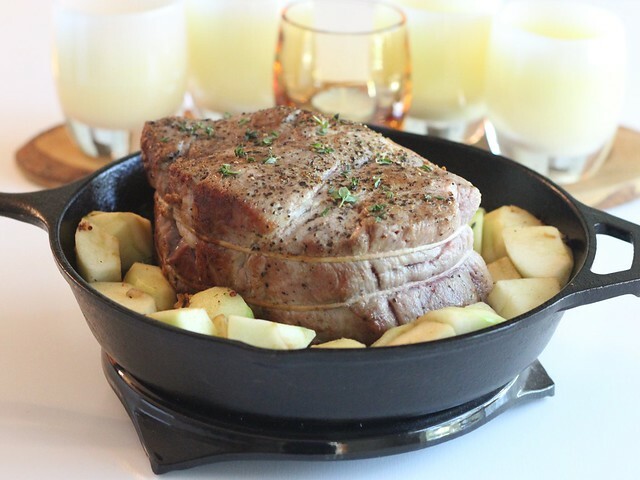 Simply sear the meat to a nice golden brown on all sides, sauté the aromatics in the same pan, deglaze it with our reduced cider to make a quick pan sauce and finally, snuggle some nice tart apples around the roast. That’s it. Cover the pan tightly with foil, and into the oven it goes. Now here comes the hardest part: Willpower. Without fail, around the two-hour mark I can hardly stand to be home because the smell is INCREDIBLE. No joke, I often run some errands or find any excuse to get out of the house during that final hour. It’s legit hard for me to focus on anything besides the deliciousness tickling my nose, tempting me to sneak a peek or snitch a tiny, not-quite-perfectly-tender piece. Basically, if you’re anything like me, just be ready and plan something to keep you occupied during this time. Okay, so once the pork practically falls apart with the tap of a fork, and the apples are reduced to a sweet-tart mostarda — essentially saucy goodness made from fruit and mustard (I was admittedly a little wary when I first heard of the combo, but trust that it’s delish) — we’ve entered the home stretch. On the side, I like to keep things simple and a little more Southern-inspired with some creamy, cheesy grits. Cheddar and pork, cheddar and apples. We’re talking classic combos that just work. Even better, whipping up a batch involves no more than boiling water and some stirring. The grits are by no means essential, though. I imagine potatoes — steamed, roasted, mashed or even au gratin — maple-roasted acorn squash or something along those seasonal, starchy lines would work equally well. Plate it all up, dig in and don’t expect to have leftovers! Let’s talk about our favorite comfort foods in the comments or on Facebook! 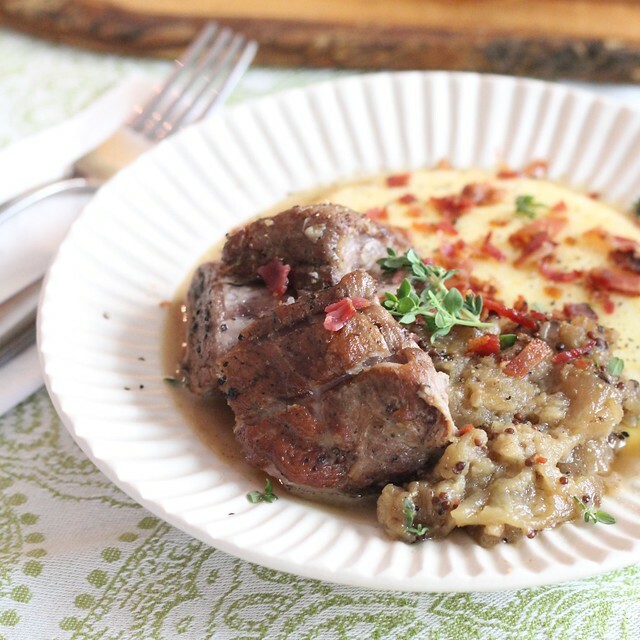 I’m partial to cheesy grits as a carb-centric side to serve with this dish, but potatoes (in just about any form) are an equally delicious accompaniment. Feel free to use an appropriately-sized Dutch oven instead of the cast iron skillet, if desired. In a 10″ cast iron skillet, arrange pancetta slices in a single layer. Set over medium heat and cook, flipping every couple minutes, until crispy. Remove pancetta to paper-towel-lined plate; set aside. Toss apples with cider vinegar in a small bowl; set aside. Increase heat to medium high. While pan warms up, season pork shoulder on all sides with Kosher salt and black pepper. Once pan is hot, sear for about 30 seconds on each side, just until lightly golden and it releases easily; set aside on a heatproof plate. Lower heat to medium, add shallots and cook, stirring often, until softened and brown. Carefully deglaze pan with reduced cider, scraping up all the good stuff at the bottom of the pan. Allow cider to come to a boil before stirring in Dijon. Add apples (and any cider vinegar in the bottom of the bowl) to the pan. Quickly toss to coat apples in sauce, then move them to the outer edges of the pan to form a ring. 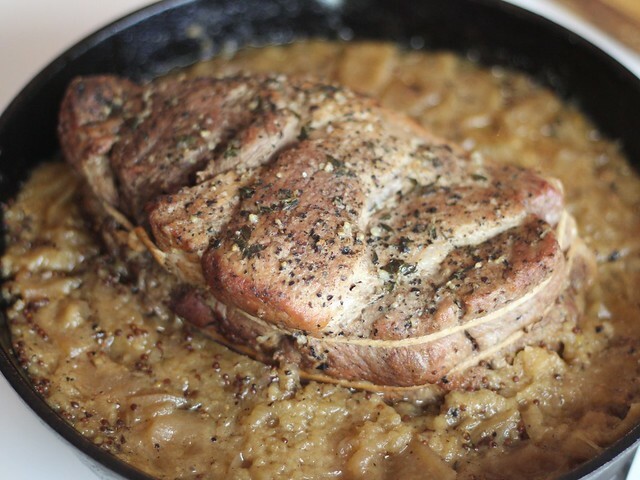 Place pork shoulder in the center, arranging apples around the roast. Sprinkle roast with thyme. Tightly cover pan with a double layer of aluminum foil. Place in preheated oven (you may want to put a sheet of foil or a foil-lined rimmed sheet pan underneath juuust in case there’s any boil over) and cook for 3 hours, or until tender. Remove pan from oven, allow to rest (covered) for at least 15 minutes before serving. While roast rests, make cheesy grits (recipe follows). In a 4-quart saucepan, bring water to a boil over high heat. Slowly whisk in grits and salt, return to a boil then reduce to low. Simmer, whisking often, until thick and soft, about 15 minutes. Whisk in cream, and return to a simmer. Whisk in cheese and proceed to plating. Once pork has rested, transfer roast to heatproof plate to untie and carve. 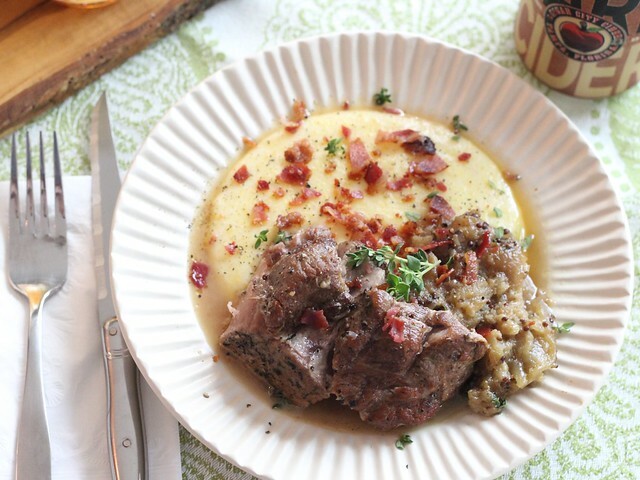 Serve pork with a spoonful of apple mostarda and scoop of grits. Garnish with fresh thyme, if desired.